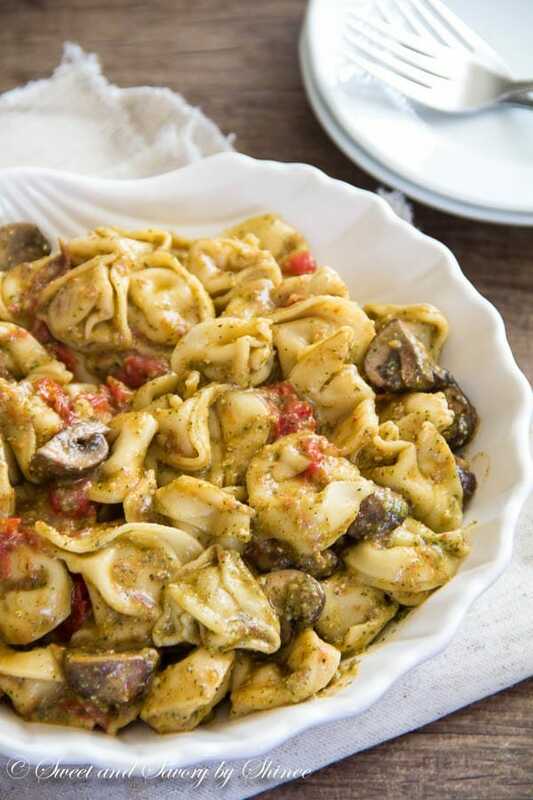 Quick and tasty pesto mushroom tortellini can be served as weeknight dinner, or last minute appetizer. It comes together in under 30 minutes. Welcome to the very first recipe of 2015! Yay, I’m so excited for this New Year, as I’ve already planned so much! Now, how do you feel about NY’s resolutions, ya or nay? I’m all about resolutions. It helps me to focus on my main goals and jump-start the year with an excitement. I bet #1 resolution among those of us who make them is related to our diet. As a food blogger and a chocoholic, I’m no exception. My main goal is to have a balanced healthy diet. I’m not planning to cut off sugar, or go on Paleo diet, or anything like that. The word DIET makes me hungry, even if I just had a bowl of potato salad. No, instead of following certain diets, I’ll be focusing on portion control and discipline. I’ll enjoy that cake, but just one slice. I’ll have that cookie if I want to, but one will be enough (hopefully!). I hope I can stick to this plan all year round. Cheers to healthy 2015! Anyway, when I was in college, I was all about quick and easy meals. One day, my roommate bought this tortellini and we loved it. It was tasty, fresh and so versatile. Just changing the sauce would yield different variations, and that’s why it was one of our staples in the fridge. And even now, many years later I still enjoy the same tortellini just as much as I loved it the first time. When I got this opportunity to work with BUITONI® and share my recipe using their three cheese tortellini, I couldn’t be happier. 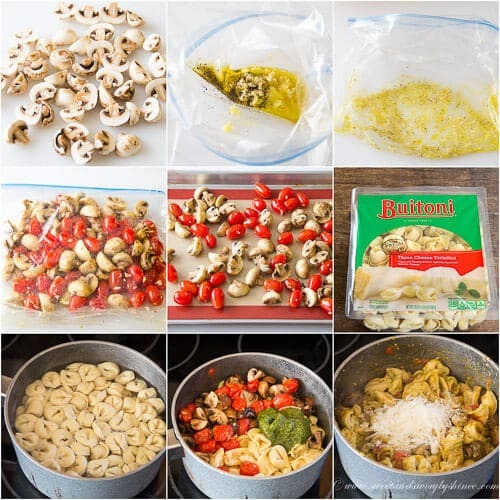 Today’s tortellini is just one of many variations. It’s the quickest and tastiest of all. 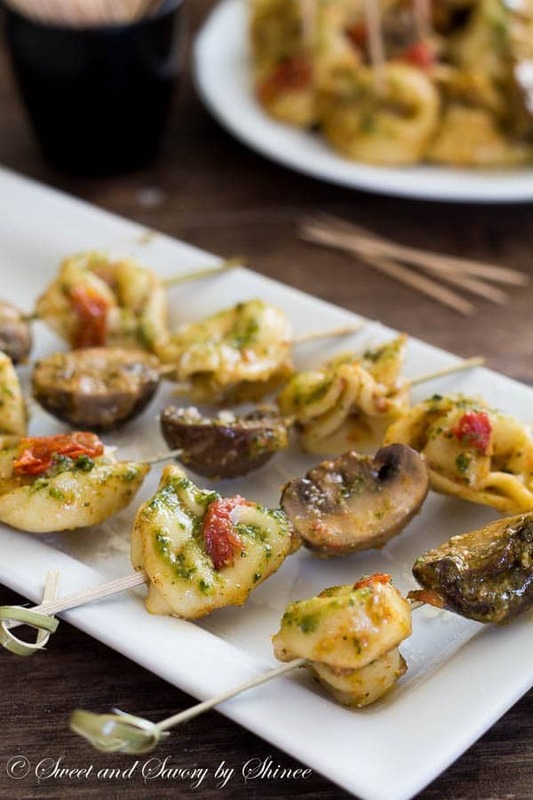 We’ll roast mushrooms and grape tomatoes, while tortellini is cooking. Then we’ll mix the two together with some pesto sauce, and the dinner is ready to serve. And you know what? You can totally serve this as an appetizer. 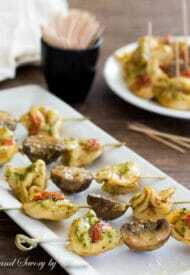 Thread them in the skewers, or serve it in a bowl with toothpicks. Aren’t they pretty and colorful? Add this simple, yet flavorful dish in your dinner rotation this year. 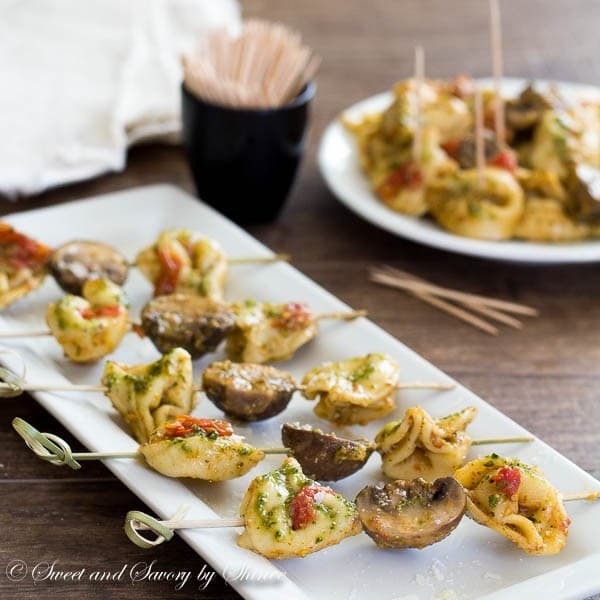 Quick and tasty mushroom tortellini can be served as weeknight dinner, or last minute appetizer. It comes together in under 30 minutes. Cut the mushrooms in half. In a large ziplock bag, combine olive oil, pressed garlic, salt and pepper. Add mushrooms and tomatoes. Zip the bag and mix everything until well combined. Transfer the mushrooms and tomatoes onto a baking sheet lined with silicone mat or foil. (If using foil, spray some non-stick spray, or lightly oil the foil.) Bake for 15-20 minutes until tender. Cook the tortellini according to package directions. Drain the water. 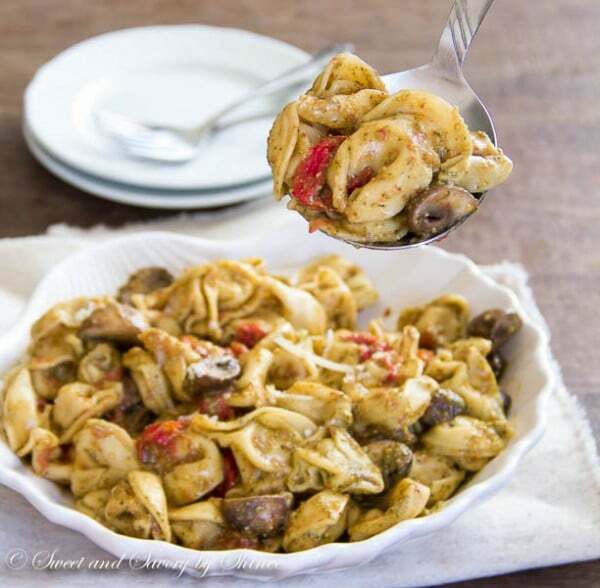 Combine tortellini, mushrooms and tomatoes in the pot. Add pesto and mix well. Grate in some Parmigiano-Reggiano, if desired.